The beautyblender Glow All Night Set is an essential collection to keep makeup looking flawless for longer. Perfect in your purse or desk at work, this must-have set will become your mini skin saviour. An award-winning makeup applicator sponge with elliptical shape to ensure a flawless and professional makeup finish, without streaks or lines. Effortlessly applies creamy primers, foundations, concealers, blushers and more with natural results. A multi-tasking face mist that refreshes makeup through the day while enhancing luminosity. The shake-to-wake bi-phase formula combines a supercharged antioxidant water (infused with White Birch extract and Hyaluronic Acid) with a milky, probiotic and Silk extract-enriched oil to instantly nourish, hydrate and plump the appearance of skin. Delivering mega-moisture and radiance, the face mist can be used throughout the day to revive dull skin or give matte foundation a dewy appearance. Built with a fine mist nozzle, its delivery won't disturb makeup, so it can be used at any time to perk up lack-luster skin. Expect glowing, flawless-looking skin with no dry patches, dullness, caking or fading. Not just for your face, rehydrate your beautyblender with a spritz of this silky mist for an ultra-smooth touch-up. 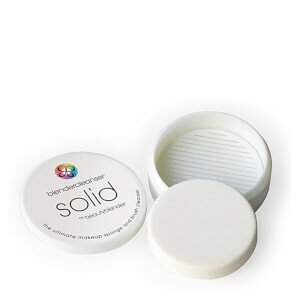 A multi-tasking makeup applicator that applies and blends powder products for an airbrushed appearance. Easy to use, the double-sided powder puff has been perfectly sized and shaped for maximum precision and flawlessness. The teardrop design deposits the perfect amount of powder when setting and baking makeup, and its handy finger pocket ensures ultimate control when smoothing and blending product onto skin. Designed to expertly apply and touch-up your powder, the plush pink side is perfect for setting makeup in place, while the tan buffed suede re-blends makeup for a smooth and seamless finish. Also features a stretchy, interchangeable finger band for versatility. Blender: Wet with water, squeeze out the excess liquid (using a towel if available) and then bounce concealer, primer, foundation, powder, cream blush or any other complexion product across the face for flawless results. Face Mist: Shake bottle well so the two phases combine. Hold bottle 6-8 inches away from face, close eyes and mist directly onto skin for the perfect boost of hydration and luminosity. To retouch makeup, spritz saturated sponge to easily reblend. Powder Puff: Deposit powder with the plush pink side to set and bake makeup. Re-blend and touch-up using the tan buffed suede side. Target contours of the face with the narrow tip, insert fingers into the pocket for further precision. Rest hands on puff during application to prevent makeup from smudging. Use the finger band for all over application ease or slide fingers into the pocket for more precision. Please hand wash only. Tip: Instead of laying fingers on the face during makeup application, use the puff as a hand guard, preventing makeup from smudging. Face Mist: Water/Aqua/Eau, Dimethicone, C12-15 Alkyl Benzoate, Butylene Glycol, Glycerin, PVP, Coco-Caprylate/Caprate, Hydrolyzed Silk, Betula Alba Bark Extract, Hydrolyzed Hyaluronic Acid, Tocopherol, Lactobacillus Ferment Lysate, Leuconostoc/Radish Root Ferment Filtrate, Bis-Diglyceryl Polyacyladipate-2, Ethylhexylglycerin, PEG-10 Dimethicone, Poloxamer 407, Sodium Hydroxide, Phenoxyethanol, Sodium Benzoate. Blender: Latex Free Polyurethane Foam.